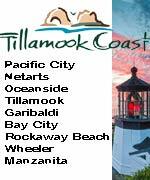 (Waldport, Oregon) - From the southern parts of Newport, known as South Beach, it's a wild little nature walk through the eight or so miles of that village, Seal Rock, Waldport, and the areas in between. South Beach is, of course, where the Oregon Coast Aquarium and the Hatfield Marine Science Center are found – well known Newport mainstays. But the coolest aspects about this section of town, and the beaches between here and Yachats, are the pristine nature of the sands and the proliferation of hidden spots. Things begin at the southern jetty (seen below). A one-mile loop trail through forestland is the highlight here, taking you through marshy ponds and giving you up-close glimpses of osprey, their nests and other wildlife. You’ll find the entrance on the east side of the highway, just after the South Beach district ends and just before the entrance to South Beach State Park. You enter this enormous area almost a mile after the South Beach business district ends, and then it stretches all the way northward back to the South Beach jetty. On the beach, it’s almost a mile to the jetty. Hiking south on the beach, it’s almost five miles worth of sand until you hit Ona Beach. There are other trails in the park, including the 1.3-mile-long stretch of the Cooper Ridge Trail which treads through the woods. It has been host to a yearly Renaissance Faire, although that seems to be have disappeared. 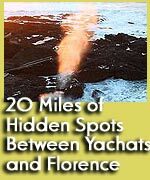 But a set of truly hidden crescent-shaped dents in the cliffs lie near a hidden beach access about eight miles south of Newport. Look for the Stonecrest Cellars B&B, not too far MP 146, and perhaps a quarter mile south of that you'll see an unmarked beach access with a gravel patch by the side of the road. There is no signage, but it is technically called Holiday Beach or the Thiel Creek area. As you move southward, the highway soon becomes a tunnel of wind-swept trees, often looking gnarled, knotted and bent landward by living in enormously windy conditions. It’s lovely, a little eerie, and certainly dramatic. At about MP 147 Lost Creek appears. A small parking lot gives way to a picnic bench or two, pit toilets and a slightly high vantage point to watch the waves or sunsets. Follow the paved path down to the broad, sandy beach. It’s here where ghost forests and agate beds sometimes show up in winter. A small, unmarked beach access lies just south of the Lost Creek entrance. Ona Beach (Brian Booth State Park and Beaver Creek). The park encompasses Ona Beach and the inland wetlands area of Beaver Creek. Ona Beach and its park are a pleasant respite, with a small trail meandering next to the creek and a lovely little footbridge getting you onto fluffy dunes, and then leading you to this large beach. At low tides – and if the sand levels aren’t too high – odd tracts of rock structures emerge, containing a myriad of sea life. Agates sometimes abound here as well during winter. There are full restroom facilities and a boat ramp. And the park features a variety of picnic tables with little fire pits – so barbecuing just seems as if it should be de rigueur here. On cold winter nights, the bridge going over the creek can get very icy – more so than other areas nearby. There’s maybe a quarter mile of a town here, but it contains a couple of treasures. Some coffee, cookie and curio shops line the tiny patch of a business district next to 101. This has been the site of at least one business over the decades, where whimsical cowboy characters created by wooden, chainsaw sculptures inhabited a mythical Old West town. A variety of gift shops inhabit Seal Rock and much remains in the old west-like architecture. Mysterious stumps sometimes show up at the Curtis St. access. Seal Rock began its days as a budding resort town back in the last century, but various failed deals and a railroad line from the valley that never happened resulted in this seaside hamlet surrounded by wondrous, unspoiled natural attractions. A tad north of the entrance to Seal Rock State Park sits this small path down to the beach. Look for Curtis St. and it’s directly below. This dynamic and enchanting spot offers a few winding paths and a lot of basalt or sandstone to frolic on and ascend, including a few structures which provide some beautiful views of an often wild surf. Clambering up and down these is some of the most amusement you can have on Oregon’s coast. There is one area of sea stack rocks that forms a narrow split, which is climbable and full of fun. This section of rock channels the tide farther in than other spots on this beach and at the same time allows you to climb around on it, taking you out over the rough tide and offering you a somewhat unusual little viewpoint from which to watch the action. Look for the large grooves – or simply the patterns of diagonal lines made by rocks slightly separated from other rocks: these are former fault lines now literally set in stone. This overlook provides great views of the large, weird grooves on the southern end of the Seal Rock cluster of structures. You’ll find it just south of the park entrance. To the south of the viewpoint there’s another unmarked beach access. In the midst of this forest sits the eye-catching, undulating architecture of the Triad Gallery building – a landmark since at least the early 90’s. This rolling, winding and almost alive building is made of cedar and is a product of architect Glen Howard Small. It is an unusual structure, even for a large city, and most certainly so for something in the middle of a kind of coastal nowhere. But its curvaceous design and ethereal beauty somehow echo, indeed almost mimic, the ocean waves and the mountains to the immediate east, and its dazzling esotericism is accentuated by the presence of a neon horse sculpture in the front. It is now a real estate firm. Suffice it to say this spot is aptly named, with an enormous sandy beach often quite populated with large chunks of driftwood. The parking lot high above the beach makes for a great viewpoint if you don’t feel wandering down the entirety of the trail to the bottom. There are picnic tables and some restroom facilities there as well. Just before you wind up in Waldport, and just a tad north of the bridge, there’s a store, a small road and signs pointing to a major hotel. This is the Bayshore area of Waldport, which includes a small labyrinth of neighborhood roads and a few beach accesses between them. It’s not as friendly to beach-goers as it was in the ‘70s, before hordes of homes filled the foredunes that separate the neighborhood from the tumbling collection of dunes and the beach. Still, this beach is accessible at several points, although these dunes often flood your eyes with sand because of the Oregon Coast’s notorious and sometimes infinite capacity for wind. There is a spit to its south, which stretches for a ways into Alsea Bay. It’s well worth hiking – and sometimes wildlife, like elk or seals, are spotted around there. This stately beauty is a decent attempt to replace the original, which was designed by Oregon engineer Conde B. McCulloth and dedicated in 1936. By 1991, construction was finished on its replacement, and many around Oregon watched in sadness as the old one - increasingly dilapidated with age - was blown up. These days, it’s still a beautiful sight, and boasts sidewalks on either side, perfect for strolling and capturing memories and sights on camera. At its northern end, just south of the road to the Bayshore community, lies the Alsea North Wayside. Here is a parking lot and viewing area, with access to either the bridge sidewalk or the short tracts of sand and boulders that run beneath the bridge and connect to the spit. Crabbing is popular on this bay, as is watching seals basking themselves in the sun upon mud flats at low tide. This is a fun little museum, lying at the southern end of the bridge. Dive into local history and the tales of transportation along the coast, complete with photos, exhibits and objects from another time. The facility is wheelchair accessible. Call: (541) 562-2002. The parking lot also allows you access to the bay’s southern side, including walking beneath the bridge, lower tides permitting. Large boulders also occupy this sandy stretch, which makes for all kinds of climbing fun. This winding route is definitely the slow way to go back inland (or to the coast), but it’s stunningly scenic and well worth the drive. Especially in spring, this long, meandering road takes you to Corvallis – but at times makes you believe you’re going there via Switzerland. When this area is green, it’s really green, looking like parts of rural Europe with charming pastures and rainforest-like foliage enveloping you. Several parks along the way are well worth the stop as well. Marys Peak, near Corvallis, is probably the most notable. This is a whole day’s trip in itself, where the tallest point on the coast range can give you glimpses of enormous vistas for hundreds of miles around you on clear days – including glimpses of the beach or glorious views of major mountains to the east, north and south. At other times, it’s not uncommon to find yourself having driven above the clouds, which is an ethereal experience you don’t want to miss. The route takes over an hour to get back to the Willamette Valley, and there are often no gas stations for many, many miles. The town’s early years were apparently influenced by German immigrants, who used “wald” – the German word for forest – as part of its name. Indeed, the forest behind it is a thick and lush one, sometimes known for bear sightings. It’s been the runt of central coast towns for decades, and seems to be just pulling out of that slump with some new renovations. As you get ready to leave Waldport, heading south, you’ll find this park just to your right - and just before the bay. 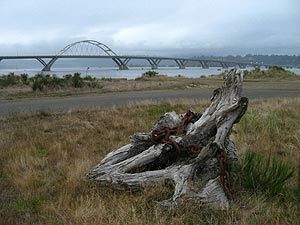 In fact, it provides some wonderful views of the southern side of Alsea Bay as well as the bridge. From here, you can also wander onto the sands of the bay and walk all the way to the bridge. 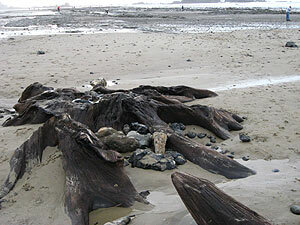 At low tides, you can even get onto the mud flats. The highway curls around a bit and uphill at this point, heading towards Patterson State Park and Yachats. In stormier weather, this area creates quite a spectacle as the waves slam against the concrete walls just below the highway. Sitting in the parking lot of Keady is a prime place to watch this. About 20 years ago, this park’s biggest claim to fame was the spot where part of the New Carissa washed ashore after being blasted in half and almost carried out to sea. The ship was an impressive sight as motorists whizzed by. These days, it’s back to normal. Groves of trees surround the parking lot, a few picnic tables and some trails to the beach make this a placid place. 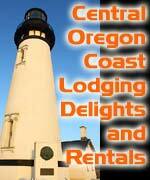 You can easily walk here from Waldport via the bay at low tide, or just walk up the hill along the highway. There’s limited parking by the side of the road here, but it is possible to find a small trail meandering down to the beach near the bridge. This beautiful little place is so close to the ocean waves that at certain times of the year it’s prone to flooding and shut down. It all begins with a small forest between you and the sea, which seems a bit like a giant, leafy tunnel. About a mile south lies the famed Tillicum campground – and just a ways from there lay the wonders of Yachats.